These are among the questions that we will delve into in my new podcast: For Immediate Release (FIR) on Higher Education, which is part of the For Immediate Release podcast network. Each FIR on Higher Education episode will consist of an interview with a professor, communicator, researcher, administrator or a journalist, among others. I will also look to receive reports from guest contributors (if you are interested, please let me know). Podcasts have been a tremendous source of learning for me. There are several shows I listen to regularly that are my means to free and on-demand continuing education. At the top of my weekly listening is For Immediate Release, the Hobson and Holtz Report, a show hosted by two extremely knowledgeable communication professionals: Shel Holtz and Neville Hobson. Their weekly podcast is filled with all the latest news and insights regarding communications. I carefully listen to each episode and follow (and sometimes participate) in discussions that ensue on the For Immediate Release Google Plus Page. Shel and Neville decided to introduce new shows under the FIR name (which is already a very strong brand). In my opinion, this is a brilliant move. By bringing on shows focused on particular niches (such as strategy, internal communications and LinkedIn), the For Immediate Release podcast is extending its reach in a significant way. My goal with For Immediate Release on Higher Education is to complement this line-up of communication podcasts by offering a show particularly geared to individuals working within higher education. The industry has its own unique set of communications challenges and opportunities, and I intend to explore these different areas in the podcast. Shel and Neville’s show is brilliant not only for the insights they bring to the table, but because of how they leverage contributors and the overall FIR community. I would like to take a humble attempt to follow in their footsteps and foster a community with For Immediate Release on Higher Education. Therefore, if you work within higher education and would like to provide a regular update, please do let me know. In addition, feel free to pitch me stories and initiatives within higher education that you think should be covered. 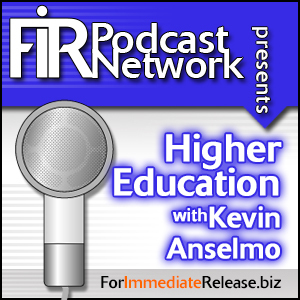 The first episode of For Immediate Release on Higher Education with Kevin Anselmo will be posted on December 26th. Beginning in 2014, I will be publishing two shows per month. I am very excited about hosting this show, and am confident you will enjoy listening.